A bit of cross-pollination, this week. Wonder—as in “sense of wonder” rather than “Hmm . . . I wonder . . .”—has long been a thing encouraged in my household. We love it. I mean, there are phenomena in this world that are just so . . . wonderful . . . that they make me glad to be alive. I have some tried-and-true sources for “sensawunda.” Watching a cephalopod change the color and texture of its skin in the blink of an eye. Standing in the middle of a Gothic cathedral and looking up at tons of stone that hang above me, all lifted by human hands, all suspended by the power of physics. Seeing the spirals amid the seeds of a sunflower or embedded in a sectioned nautilus shell, and recognizing the mathematics (which I poorly understand) that predict each rank, each row, each curve. Recently, though, I hadn’t experienced that sensawunda—life has been filled with too much of the pedestrian and mundane of late—and I had actually forgotten how lovely a few moments of wonderment can be. A short time ago, the VISTA (Visible and Infrared Survey Telescope for Astronomy) was doing a “warm-up” routine. It was pointed to a random spot and took a photo. You know, like you, with a new camera, might take a shot of the street outside your house. But in this analogy, when you took a shot of that street outside your house, you caught the newest Ferrari driving by, or of that model from the Fiat Abarth commercial, or of . VISTA, in an unintentional moment, captured a stunning image of 47 Tucanae, otherwise known as NGC 104. 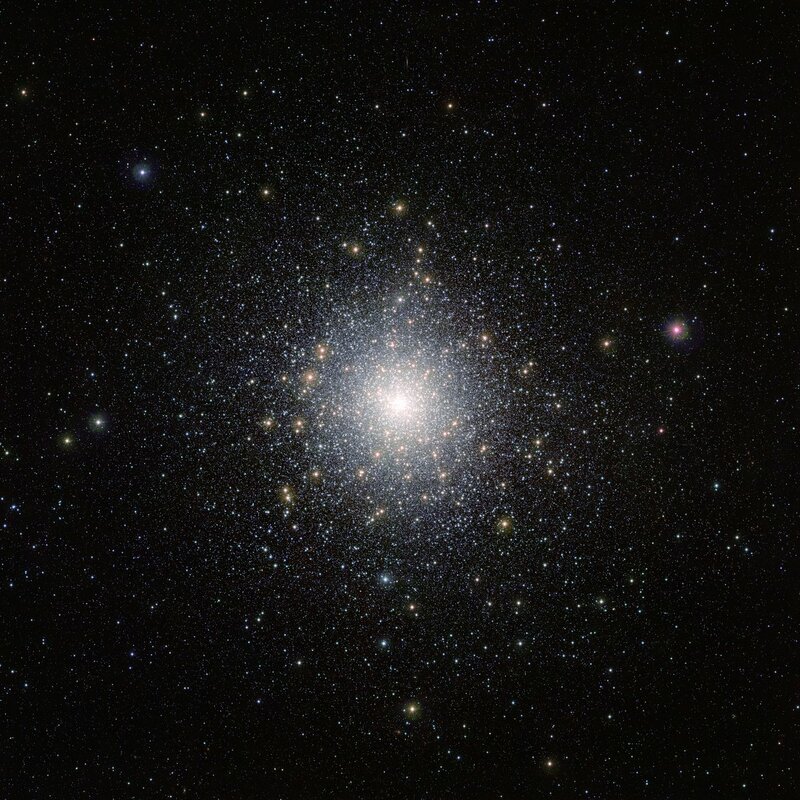 47 Tuc is a huge globular cluster of millions of stars crammed into a 120 light year diameter sphere. They all orbit the gravitational center of this cluster, but each in its own direction, buzzing around the core like angry bees. This accidental picture is amazing, and if you can, I’d recommend you download the massive 8000×8000 image and play with it a while. I did, and I zoomed in and out on blue giants, red giants, a field of stars so densely packed that they’re like pave diamonds. In the outer sectors of the image, you can zoom in and, between the stars, see red-shifted galaxies. It’s amazing.